The owner of a beautiful red brindle greyhound sticks her head out the back door and yells, “Already BenThere, come.” The cute little greyhound comes running to her mama. “Here is your cookie, Already. Go back and play.” Already BenThere bounces back out into the yard to play some more with her friend, PB Black Tauren. Egad, what is going on here? The “what” that is going on here is your greyhound’s racing name. Therein lies the problem. With so many greyhounds being registered in “each calendar year” selecting a unique name can be quite difficult. One could debate, however, the “tastefulness” of racing names that have come with the dogs at our adoption kennel during the past 8 years. Head Knocker, Corn Beef, Bad Credit Kid, Char Pei Diem, Marshmallow Onie, Deaf I Am Not, Ping Odd Pong, Betsy Boo Boo, and Zia Vang, among them. Back to the greyhound at the beginning of this story, Already BenThere. She was two years old when I adopted her, a very pretty red brindle with a white chest, four white feet and just a tad of an overbite. I certainly could not call her Ben or Already. In her foster home she was called “Everly” after the foster family’s love of the Everly brothers. This name did not seem to suit her, either. So the hunt was on. The greyhound that shares your life will carry his name till the time he goes over the Rainbow Bridge. You have a little more leeway than naming children, where you must give thought to peer’s acceptance, the blending of first and last names and how the initials may appear. It is still no less a daunting task. Here are some general tips in naming your greyhound. Pick a name that your hound can easily recognize. Dogs respond better to names that are one or two syllables long. If you are choosing a long name, keep in mind the shortened version. A long name will inevitably be shortened, but it may ruin the effect that you were originally looking for. Take for example our calico cat’s name. We named her Calypso (a very original name), if shortened to “Cally,” a very unoriginal name. The inspiration that we use to name our dogs can be many. People sometimes choose popular dog names. The top ten names for male dogs in the United States in 1998 were: Max, Jake, Buddy, Bailey, Sam, Rocky, Buster, Casey, Cody, and Duke. The top ten names for girls in 1998 were: Maggie, Molly, Lady, Sadie, Lucy, Daisy, Ginger, Abby, Sasha, and Sandy. People will sometimes choose their new dog’s names before they even have their dog. They may use a variety of other inspirations as well. They may well wait a few days after their new greyhound has taken up residence. Studying their dog’s behaviors and personality will give them the necessary clues. Other people will use the inspiration of the color of their dogs’ coat or body appearance. A lovely white greyhound may sport the name of Blitz. Other inspirations will come from books, foreign names or words, mythology, New Age, popular characters in media, aristocracy, popular human names, whimsical names etc. In our household Tauri was named for the Zodiac sign under which he as born. 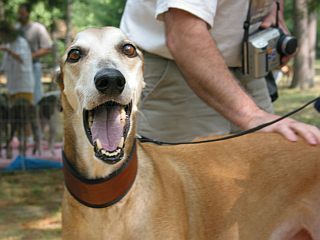 The red brindle greyhound that is mentioned above, “AlreadyBenThere”, carries the name “Feather” now. She truly resembles a quail feather. Magi, (our Australian Shepherd) received his name before his birth. The serendipitous/synchronistic story surrounding his mere conception inspired this author to feel as if it was “Christmas Magic” in March. We named our male Greyhound “Cairo”. After the city in Egypt. He’s a big dark brindle and it suits him. We thought about the ancient Egyptians love for the breed, and how they were revered among the Egyptian nobility. His racing name was Jj’s Lone Cry, and his nickname was Alvin…I don’t think so! Our female had the racing name JB Teasing Ann, and her nickname was Ann. But since we had a previous female Grey names “Annie”, we decided to name her “Petra” after the city in Jordan that is carved into the desert mountain. Petra means ‘rock’ in Greek (the feminine of Peter) She is a dainty red-fawn and resembles the sands of a desert, and she is also scarred from her racing days so Petra was an appropriate name! We almost named her Egypt to compliment Cairo…but she’s a definite ROCK..Petra!